We are honored to spend the day with the 118th Military Police Company (Airborne) from Ft. Bragg and we invite you to drop in for a cookout. 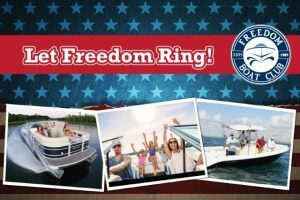 Freedom Boat Club is hosting a Fishing/Boating Trip and Cookout called “Let Freedom Ring” to honor several of our Military Police Soldiers from Ft. Bragg who are soon to be deployed. This event will provide the opportunity for our members and guests to honor and spend time with those who proudly serve our country every day. Please come show your gratitude and support for our soldiers. The soldiers will depart on eight boats from the Freedom Boat Club at Harbourgate Marina at 8am on April 25, 2017. They will return to the docks after a full day of boating or fishing at 3pm to a cookout provided by Freedom Boat Club to honor them.